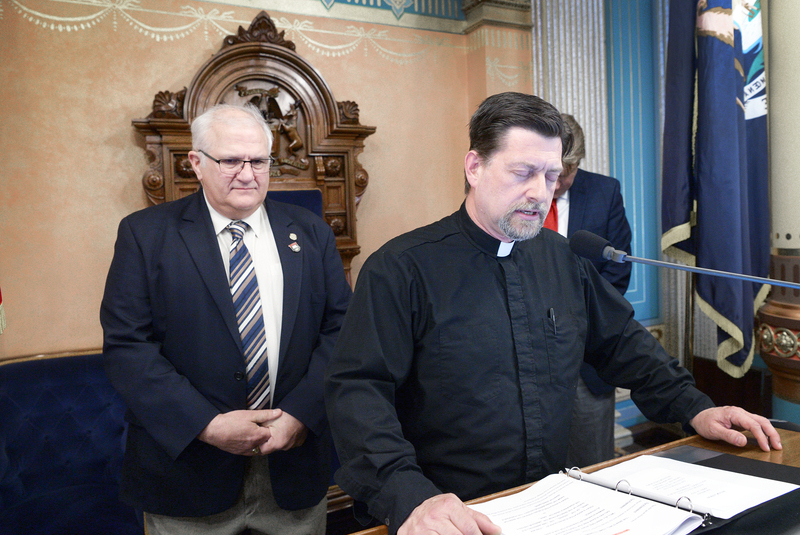 LANSING, Mich. — Sen. Dale Zorn, R-Ida, welcomed the Rev. 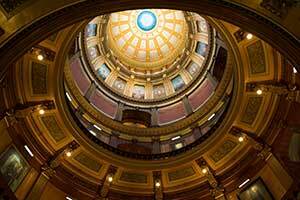 D. Lee Cullen Jr. to the Michigan Capitol on Thursday. 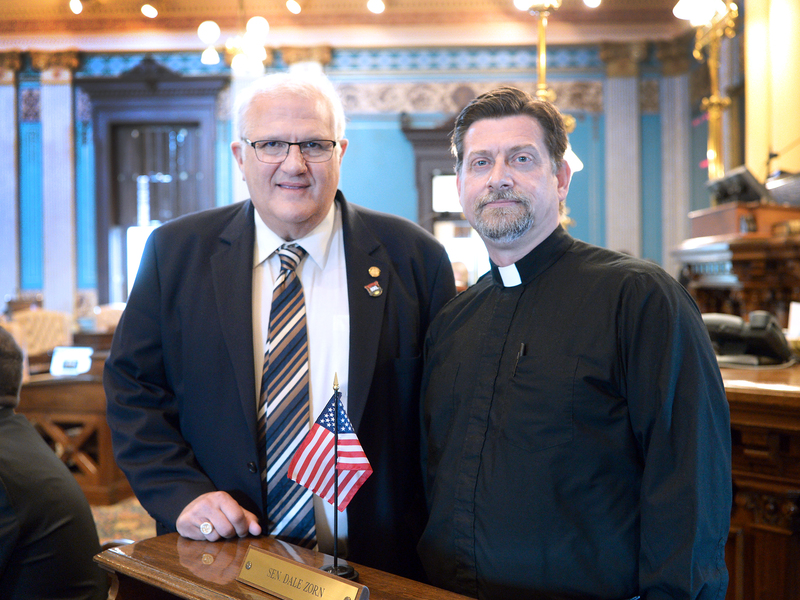 Cullen serves as pastor at Holy Ghost Lutheran Church in Monroe and delivered the invocation before Senate session. Editor’s note: The above photographs are available by clicking on the images or by visiting Zorn’s website at www.SenatorDaleZorn.com/Photowire. Video of Cullen’s invocation is available by clicking here or by visiting www.SenatorDaleZorn.com/Video. We are blessed to have world-class natural resources and numerous outdoor activities in Michigan that help make our state such a great place to live and raise a family. Among these activities are hunting and fishing, which have been family traditions for longer than Michigan has been a state. Our sports men and women are among Michigan’s greatest custodians of the state’s natural resources — and they also are important to our economy. According to a report commissioned by Michigan United Conservation Clubsand based on a study by Michigan State University professors and researchers, hunting and fishing generates $11.2 billion for Michigan’s economy each year. I hope you all have a chance to get outdoors and experience everything Michigan has to offer. “I was encouraged to see the governor put a priority on continuing to make important investments in teaching our children, training our workers and fixing our roads. “While it is disappointing that the governor’s plan relies on a large tax increase, this is just the beginning of the budget process. “I look forward to working with the governor to finalize a balanced state budget on time that supports our students, protects our communities and helps attract new investment and jobs. LANSING, Mich. — Sen. Dale Zorn on Friday applauded a Michigan Department of Agriculture and Rural Development (MDARD) grant to the Monroe County Conservation District to help protect water quality. The Monroe County Conservation District has been awarded a $400,000 Soil Testing to Reduce Agriculture Nutrient Delivery (STRAND) grant — from federal funds — to reduce total phosphorus and soluble reactive phosphorus through nutrient management and best management practices focusing on sustainable change in water quality. STRAND is a collaboration between MDARD and local agriculture and conservation partners to help farmers in the Western Lake Erie Basin reduce the amount of phosphorus entering Lake Erie. To reduce phosphorus runoff, STRAND will work with farmers to increase adoption of grid/zone soil testing and other nutrient management practices.